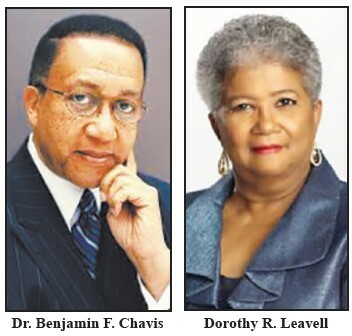 Dorothy R. Leavell and Dr. Benjamin F. Chavis, Jr., leaders of the National Newspaper Publishers Association (NNPA), will be special guests at The Savannah Tribune’s 143rd Anniversary Celebration. The Tribune Anniversary celebration event will be A Biscuit Brunch and Sneaker Ball on August 11th at the DeSoto Hotel. Leavell is Chairman of the NNPA and Chavis is the President and CEO. This year, the NNPA is celebrating the 191 Year of the Black Press in America. Leavell was elected NNPA Chairman in June 2017. She is editor and publisher of The Crusader Newspaper Group which publishes the Chicago Crusader and the Gary (IN) Crusader, both of which were co-founded by her first husband, the late Balm L. Leavell, Jr., in 1940 and 1961, respectively. Leavell has been an active member of the NNPA for more than 49 years, having served as Chairman of the NNPA’s Foundation, 2006-2011. The Foundation is the philanthropic arm of the Association which also oversees the NNPA Black Press Archives housed at Howard University in Washington, D. C. NNPA President and CEO Benjamin Chavis is also the President of Education Online Services Corporation (EOServe Corp), the world’s leading provider of online higher education for Historically Black Colleges and Universities across America, and President and CEO of the Hip- Hop Summit Action Network (HSAN), the world’s largest coalition of hip-hop artists and recording industry executives, which he co-founded in 2001 with Russell Simmons. Chavis holds the Master of Divinity and Doctor of Ministry. He held executive positions with the United Church of Christ Commission for Racial Justice (UCC-CRJ) and the National Council of Churches of the USA. During 1993 and 1994, Dr. Chavis served as the Executive Director and CEO of the National Association for the Advancement of Colored People (NAACP). He was National Director and organizer of the Million Man March in 1995. At the age of 24, Chavis was sentenced to 34 years in prison while seeking to desegregate the public schools of Wilmington, North Carolina. After he served 2 years, this case of the Wilmington Ten was overturned on appeal and became known internationally as one of America’s most prominent examples of virulent racist political prosecution. Dr. Chavis began his career in 1965 as a statewide youth coordinator in NC for the Reverend Dr. Martin Luther King, Jr., and the Southern Christian Leadership Conference (SCLC). The National Newspaper Publishers Association (NNPA) is a trade association of the more than 200 African American owned community newspapers from around the United States. Since its founding 75 years ago, NNPA has consistently been the voice of the black community and an incubator for news that makes history and impacts our country. As the largest and most influential Black-owned media resource in America, NNPA delivers news, information, and commentary to over 20 million people each week. Americans from all backgrounds seek news from the Black perspective from the NNPA member newspapers around the country. In America, now among the most diverse countries in the world, the Black Press of America is more relevant than ever.” The NNPA was founded by Savannahian John H. Sengstacke in 1940. He was owner of the largest chain of black newspapers in the country which included the Chicago Defender, the Michigan Courier in Detroit; the Tri-City Defender in Memphis, Tennessee; and the New Pittsburgh Courier . The Savannah Tribune is a member of the NNPA. The Biscuit Brunch and Sneaker Ball is an event designed to actively engage attendees in an atmosphere of “fun, competition and service.” Highlights of the celebration will include tributes to Savannah pioneers in journalism, Verdelle Lambert, Yvonne Shinhoster Lamb, Wanda S. Lloyd and Vaughnette Goode-Walker, who made their mark in magazine, print and broadcast journalism on the national level. Also to be recognized for their contributions to the Black Press will be Floyd “Press Boy” Adams, Sr., founder of The Savannah Herald, and the Southern Regional Press Institute at Savannah State University. Special recognition will be given to renowned Savannahians such as John H. Sengstacke and Robert Sengstacke Abbott, along with The Tribune’s founding fathers, John H. DeVeaux, Louis B. Toomer, Sr., and William H. Pleasant and their legacies, Sol C. Johnson, Willa A. Johnson and Robert E. James for their contributions to the Black Press. Individuals and members of community organizations are challenged to provide a service to homeless families and Veterans in our area by contributing new or gently used sneakers (child to adult sizes) that will be donated to Family Promise of Greater Savannah and Chatham-Savannah Authority for the Homeless, and participating in the Red Carpet Sneaker Walk, wearing one’s “Fly” sneakers (The organization with the largest number of members participating in the Walk will be rewarded). Tickets are $40 each and can be purchased at The Savannah Tribune, 1805 Martin Luther King, Jr. Blvd., Lester’s Florist, (37th and Bull Streets), or via PayPal at www.savannahtribune.com/celebrate-our-history. Checks/Money Orders should be made payable to The Savannah Tribune.